MORRISVILLE, N.C. (April 24, 2018) – HexaTech Inc. announced today the launch of its 2" diameter aluminum nitride (AlN) substrate product line. HexaTech, the world’s leading commercial supplier of single crystal AlN substrates, is launching this milestone product in conjunction with this week’s International Conference on UV LED Technologies & Applications (ICULTA‐2018) in Berlin, Germany. “By challenging perceived constraints and aggressively pursuing solutions at each step of the crystal growth process, we have developed a significant shift in capability which breaks previously observed limitations. An outstanding team effort is responsible for this milestone, and sets the stage for both continued diameter expansion and increased process yields, ultimately rivaling the price:performance ratio of other mature compound semiconductor technologies, such as SiC and GaAs”, stated Dr. Raoul Schlesser, HexaTech co‐founder and VP of Crystal and Wafer Development. HexaTech’s 2" diameter substrates are available with standard lead times. For more information on this and HexaTech’s AlN substrate technology, please visit our AlN Wafer Products page, or contact HexaTech at sales@hexatechinc.com. MORRISVILLE, N.C. (February 15, 2017) – HexaTech Inc. announced today the signing of two strategic agreements with OSRAM Opto Semiconductors GmbH, of Regensburg, Germany. The agreements include a long term supply commitment for HexaTech’s aluminum nitride (AlN) substrates, direct support of HexaTech’s 2” diameter substrate development program, as well as licensing of certain HexaTech intellectual property (IP). For more information on HexaTech’s AlN substrate technology, please visit our AlN Wafer Products page, or contact HexaTech at sales@hexatechinc.com. MORRISVILLE, N.C. (July 26, 2016) – HexaTech Inc. announced today the demonstration of its first generation UVSure™ UV‐C LED, based on HexaTech’s proprietary and world-leading aluminum nitride (AlN) substrate material. The 263 nm wavelength device achieves 6 mW in a 0.15 mm2 active area die. When scaled to our second generation larger footprint, the die is expected to produce approximately 24 mW, which is twice the radiant flux of competitive products. Further, when driven in pulse mode to 300 mA, the same 0.15 mm2 active area die is able to reach 19 mW, or approximately 76 mW in the large die format. “We are truly excited to be in a position to support the rapidly expanding UV-C LED customer interest seen over the last several years,” remarked Gregory Mills, HexaTech’s Director of Business Development. “With point-of-use (POU) sterilization applications alone representing a $400M+ opportunity in the coming years, we anticipate significant corporate expansion and strategic customer engagement,” he noted. MORRISVILLE, N.C. and NAGOYA, JAPAN – HexaTech, Inc., a market leader in Aluminum Nitride (AlN) based semiconductor material and devices, announced today the signing of a broad, strategic agreement with Okaya & Co., Ltd. of Nagoya, Japan, and its US subsidiary, Okaya USA, Inc. The agreement establishes Okaya as the sole representative for HexaTech’s AlN substrate products in Japan, and also includes a direct equity investment by Okaya in HexaTech. It further sets the stage for Okaya to assume a leadership position to market and sell HexaTech’s line of UV-C LEDs targeted for launch later this year. HexaTech’s ultra-high quality AlN materials have been shown to be an essential foundation for record-setting UV-C LEDs, which hold tremendous potential to revolutionize the sterilization and purification markets, by providing compact, highly efficient, long-life sources of light. Since its founding in 1669 in Nagoya, Japan, and throughout its 346-year-history, Okaya has evolved into a global trading company, engaged in a broad range of businesses including domestic and overseas transactions in iron and steel, metals, machinery, tools, electronics, piping components and housing facilities, construction development, chemicals, foods, and many other products. As part of the Electrical and Electronic products segment, Okaya handles an extensive range of electrical equipment, including installation and power distribution systems. In the more advanced fields of electronics, Okaya is involved in the marketing of semiconductors and electronic machinery and equipment. For additional company and product information, please visit us at www.okayausa.com. MORRISVILLE, N.C. (July 1, 2015) – HexaTech Inc. announced today that it has received a continuation of funding under the U.S. Department of Energy’s Advanced Research Projects Agency (ARPA‐E) development program. The cost‐share extension is valued at $1.2 million over 1 year, and follows $2.8 million over 2 years when the contract was initiated in 2012. ARPA‐E is an innovative and collaborative government agency that catalyzes transformational energy technologies through funding, technical assistance, and market readiness to accelerate the pace of energy innovation. The HexaTech contract focuses on the development of high power semiconductor switching devices based on Aluminum Nitride (AlN) to more efficiently control the flow of electricity across high‐voltage electrical lines. AlN‐based devices should exceed the capabilities of currently used materials, enabling smaller, more reliable components. The further implementation of these components could decrease the cost of electricity transmission while increasing overall grid security and reliability. MORRISVILLE, N.C. (November 8, 2013) – Aluminum nitride (AlN) material leader HexaTech, Inc., today presented a demonstration of what is believed to be the world’s first 33 mm diameter, single crystal boule free of macroscopic structural defects. Due to its unique physical and electrical properties, AlN is viewed by many as the ultimate semiconductor platform for short wavelength, UV-C emitters and high power electronic devices. The company presented a slice from an as-grown boule, shown below in Figure 1, to evidence the structural quality achievable with HexaTech’s proprietary growth technology. “This crystal represents the tremendous progress seen during the last 12 months, where we’ve expanded our growth diameters from less than 20 mm, to over 30 mm, while maintaining every aspect of the crystal quality. Based on this success, we are even more confident in our strategy and ability to produce AlN boules of highest quality using a physical vapor transport (PVT) growth process”. The PVT crystal growth technique has been key to the development of silicon carbide (SiC) crystals, where multiple groups have already demonstrated boule diameters up to 150 mm. MORRISVILLE, N.C. (September 6, 2013) – With the demand for high quality, single crystal aluminum nitride (AlN) accelerating, HexaTech today announced that it has initiated delivery to multiple, high volume LED manufacturers in Asia. “This milestone is worth highlighting due not only to the technical achievements and quality leadership that our customers recognize with their orders, but also to our internal process capability which is able to simultaneously deliver both high quality and high volume”, commented HexaTech CEO Joe Grzyb. Mr. Grzyb further noted “these deliveries mark an inflection point in the industry, where AlN is moving from an R&D product into mainstream manufacturing. The pull this creates on our production process, generates accelerated cycles of learning, leading to even greater progress in the future”. The company also announced today a new generation of its AlN material set, with the formal launch of its AlN-50 product. This product combines the industry-leading, high quality advantages of its long-standing AlN-10 product, with that of its high UV transparency AlN-30 product. “The new AlN-50 material is the best current solution to offer customers the high bulk quality they have come to expect from HexaTech material, combined with a more manufacturing-friendly substrate for UV-C applications”, noted Dr. Raoul Schlesser, HexaTech co-founder and Vice President of Crystal and Wafer Development. HexaTech AlN-50 material is immediately available in production quantities. For more information, please visit our Wafer Sales Page, or contact HexaTech directly at sales@hexatechinc.com. MORRISVILLE, N.C. and WASHINGTON, D.C. (August 26, 2013) – The 10th International Conference on Nitride Semiconductors 2013 (ICNS-10) took place just outside Washington, D.C., and showcased high-impact scientific and technological advances in materials and devices based on group-III nitride semiconductors. As an industry leader in the field of aluminum nitride (AlN), HexaTech held a prominent position by authoring or co-authoring 15 presentations or posters during the 4 day event. Deep UV LEDs were in the spotlight at ICNS-10 and Tokuyama Corporation scientist Toru Kinoshita announced, in his invited presentation, the highest to date published output power density for deep UV LEDs. This feat was achieved by combining HexaTech’s high quality AlN substrates with Tokuyama’s highly UV transparent HVPE AlN technology. Output power density was reported to be 60 W/cm2 for LEDs emitting at a wavelength of 265 nm, which is more than a 2X increase over the output power density by Tokuyama/HexaTech, in a November 2012 issue of Applied Physics Express. HexaTech scientist Dr. Seiji Mita presented a paper entitled: “Influence of Offcut of AlN (0001) Substrates on the Optical Properties of AlN/AlGaN Multiple Quantum Well”. In his talk, it was noted that growth of multiple quantum well (MQW) structures with high internal quantum efficiency required smooth and flat epitaxy, which strongly depended on the offcut angle of the substrate. HexaTech’s control of offcut angle, coupled with the company’s AlN-RFD2 polish process, provided the ideal base for the research and important results. From longtime collaborator WideBandgaps Laboratory at North Carolina State University, led by Profs. Zlatko Sitar and Ramón Collazo, graduate student Isaac Bryan presented a paper entitled: “A Study on Homoepitaxial AlN Thin Films Deposited on m-plane AlN substrates by MOCVD”. During the talk, it was shown that the research team was able to deposit AlN epitaxial layers by MOCVD on m-plane AlN single crystal substrates, which possessed both atomically smooth surfaces and high crystalline quality. Again, the utilization of HexaTech’s industry-leading, low dislocation crystal growth process, combined with the AlN-RFD2 polish capability, allowed for a state-of-the-art demonstration of what is possible with AlN material. “However, there remains much to be learned about the materials that go into building LEDs and other devices. Fundamental materials properties can be obscured by defects, and therefore, the availability and widespread use of our high quality substrates is instrumental in defining these fundamental properties for AlN and AlGaN. The number of AlN-centered presentations at ICNS-10 indicates significant new knowledge is being generated to bring this material system closer to the maturity level of traditional semiconductor materials”, added Dr. Moody. MORRISVILLE, N.C. (April 5, 2013) – As the development and commercial integration of UV-C light emitting diodes (LEDs) rapidly expands, the need for optimum device performance and lifetime have become critical factors for customer adoption. It is well understood that substrate quality, both bulk and surface, strongly influence the ability to achieve high power density (Pout/mm2), high internal quantum efficiencies (IQE), and long device life. Complementing HexaTech’s industry leading low-dislocation bulk aluminum nitride (AlN) crystal quality, the company today announced its latest evolution in polish technology, AlN-RFD2. The AlN-RFD2 process is able to achieve surface roughness values comparable to silicon (Si), which has been perfected over decades of research and development. Typical surface roughness of HexaTech’s high quality, single crystal AlN product is <0.2 nm RMS, nearly an order of magnitude better than some other compound semiconductors on the market today. 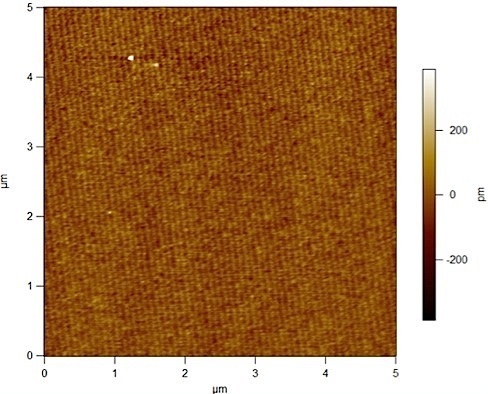 A representative atomic force microscope (AFM) image of a HexaTech AlN substrate surface is seen below in Figure 1. “With roughness being measured in the picometer (pm) range, and near defect-free atomic steps being clearly resolved, we now have a platform to produce ultra-high quality epitaxial layers, leading to maximum device performance”, commented Dr. Rafael Dalmau, Manager of Wafer Processing Operations at HexaTech. HexaTech CEO Joe Grzyb further noted, “In almost all semiconductor devices, operating lifetime is directly related to the defect density in the epiwafer. With our AlN-RFD2 process, we can offer our customers industry-leading bulk and surface quality, accelerating the development and production demands for AlN-based devices”. Record-breaking lasing performance demonstrated in optically pumped, 264 and 280 nm lasers fabricated on HexaTech AlN substrates. MORRISVILLE, N.C. – In a parallel effort to its development of UV-C light emitting diodes (LEDs), HexaTech recently demonstrated optically pumped, AlGaN-based lasers grown on highest-quality, single crystalline AlN substrates. Laser structures fabricated at HexaTech and tested in collaboration with North Carolina State University (NCSU) featured lasing thresholds as low as 85 kW/cm2 at wavelengths of 264 and 280 nm. This not only represents record-breaking laser performance, but also further validates the value proposition of HexaTech's AlN substrate platform for UV-C opto-electronic applications. “Our recent results show convincing evidence of the feasibility of a solid-state UV-C laser”, commented Dr. Andy Xie. "The tests not only demonstrate lasing at low pump intensities, but we also observed emission peak line widths as narrow as 0.02 nm, and further telltale signs of a properly operating laser, including spectrally resolved cavity modes, TE-mode polarization, and elliptically-shaped far-field patterns." The observed lasing at low pump intensities is an important milestone toward the development of semiconductor lasers operating at short wavelengths in the UV-C range. Enabled by HexaTech’s industry-leading, low dislocation density bulk aluminum nitride (AlN) substrates, these results add to the record-breaking UV-C LED and laser performance reported by other groups. 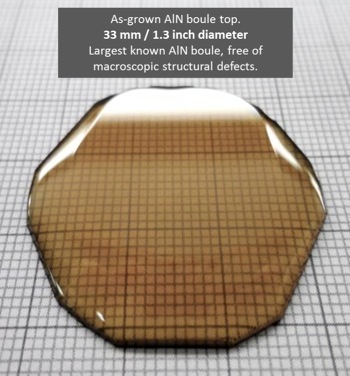 The use of high-quality, native AlN substrates that are lattice-matched to the overgrown III-nitride device layers allow for fabrication of opto-electronic devices of superior structural quality, and, thus, previously unachievable performance. Further technical details will be published in the scientific literature in the near future. HexaTech, Inc. will develop Aluminum Nitride technology for power devices to more efficiently control the flow of electricity across high-voltage electrical lines. The future “Smart Grid” requires new high efficiency, high frequency power conversion electronics to decrease the cost of electricity transmission while increasing overall grid security and reliability. This development is the first step to establish the epitaxial growth techniques and demonstrate the superior high-voltage performance capability for AlN-based 20 kV power devices. MORRISVILLE, N.C. – HexaTech has received a $2.2 M award from the U.S. Department of Energy Advanced Research Projects Agency – Energy (ARPA-E) that will enable the development of a new power semiconductor technology for the modernization of our electrical power grid. HexaTech’s high-quality Aluminum Nitride (AlN) technology was identified by the Department of Energy as a transformational, breakthrough technology with significant technical promise. Using very low dislocation density single crystal AlN substrates, HexaTech will develop novel doping schemes and contact metals for AlN/AlGaN with high Al content. Dr. Baxter Moody, Director of Engineering said “This contract marks the beginning of a technological leap in device performance and efficiency for power semiconductors. The development will enable a significant step toward producing 20 kV AlN-based Schottky diodes (SBD, JBSD) and transistors (JFET, MOSFET). The ARPA-E contract has opened the door for the material development and research to demonstrate AlN high-voltage, high-efficiency power conversion capability.” For power systems and grid-scale power conversion applications, high efficiency AlN-based power devices will offer a significant reduction in size, weight, and cooling. Power semiconductor devices at this level are not currently available on the market. Experimental devices based on Silicon Carbide (SiC) technology are currently being developed. Compared to SiC technology, it is expected that Aluminum Nitride will enable power electronics with a 10X improvement in performance. Based on the wide bandgap material properties of AlN, the critical field is 6X larger, the on resistance will be lower, and the resulting power device area will be smaller for a comparable power level. This is a transformational technology that will revolutionize the power distribution grid. MORRISVILLE, N.C. and TOKYO, JAPAN – The rapidly accelerating interest in light emitting diodes (LEDs) for disinfection applications operating at UV-C wavelengths requires a solution with high output power, high efficiency and long lifetimes. HexaTech, Inc. today announced the results of an ongoing collaboration with development partner Tokuyama Corporation of Tokyo, Japan, which has demonstrated exceptional output power and dramatic internal quantum efficiency (IQE) improvements. These results raise the bar to what is possible with the technology, and enable commercially available high performance, high reliability UV-C LEDs. By coupling HexaTech’s industry-leading low dislocation density bulk aluminum nitride (AlN) substrates, with Tokuyama’s hydride vapor phase epitaxy (HVPE) and device fabrication, Tokuyama was able to produce UV-C LEDs with over 25 mW of output power at 265 nm, and internal quantum efficiencies greater than 70%. “Working together with HexaTech and their substrates, Tokuyama has made great improvements in the performance of our UV-C LEDs, accelerating the process for their commercial availability “, stated Mr. Toru Kinoshita, Chief Research Engineer at Tokuyama Corporation. Since their inception, UV-C LEDs have held the promise of a compact, highly efficient, long-life light source for sterilization and purification applications. However, most commercially available products currently struggle with limited output power, efficiency and device lifetimes. A key requirement for improving these limitations is to drive the device defect density down, for which IQE is a key measure and is critically related to the underlying bulk material quality. “As HexaTech’s own device development has shown, using our high quality, low dislocation material, we are able to produce UV-C LEDs with record-setting reliability and lifetimes, exceeding more than 600 hours of accelerated testing, with virtually no degradation”, commented Dr. Baxter Moody, HexaTech Director of Device Development. For further technical information see our recent publication in Applied Physics Express. Morrisville, NC - HexaTech, Inc. today announced the commercial availability of a new class of high transparency single crystal Aluminum Nitride (AlN) material. This improved capability provides a significant reduction in optical absorption in the UV-C wavelengths, resulting in dramatic improvements in the processing and performance of UV-C optoelectronic components. This enhanced material will offer an improvement of lifetime and power output for UV-C light emitting diodes (LEDs). For the rapidly growing water purification market, the requirement for extended lifetime and improved efficiency are critical market enabling parameters. This new high transparency bulk AlN substrate material has demonstrated improved output performance for UV-C LEDs, by increasing short wavelength transparency, and limiting the amount of substrate thinning required for optimal UV-C emission. The improved material performance, after correction for reflection losses, exhibits absorption coefficient values of < 100 cm-1 (50 cm-1 typical) @ 265 nm, and is measurably superior to previous generations of single crystal AlN. Morrisville, NC May 22, 2012 - HexaTech collaborates with three leading research teams to accelerate the technology advancement in bulk Aluminum Nitride (AlN) substrate materials that enable UV-C LED technology. HexaTech’s single crystal AlN substrates are a critical requirement for the fabrication of UV-C LEDs with high output power and long lifetime. These parameters are key technology enablers for the rapidly expanding disinfection markets. Details of the collaboration were announced on May 14, 2012 by North Carolina State University in their press release titled “Research Opens Doors To UV Disinfection Using LED Technology”. The complete article can be found here. Additional scientific details have been published online in Applied Physics Letters in an article entitled On the origin of the 265 nm absorption band in AlN bulk crystals. On Thursday, December 1, 2011, Dr Jinqiao Xie presented a paper entitled "Fermi Level Effect on Strain in n-type GaN"
Even after two decades of intense research and development, GaN-based optoelectronic and electronic devices are still mainly fabricated on foreign substrates. As a consequence, most heteroepitaxial GaN thin films exhibit relatively high dislocation density and some remnant strain due to varied reasons, such as thermal mismatch, lattice mismatch, growth procedure, buffer layer choice and doping. Among them, the strain introduced by Si doping is the most interesting phenomena since Si is not expected to have a "size" effect. In some cases, the remnant compressive strain changed to tensile strain, as doping and film thickness were increased, eventually leading to cracks. Therefore, strain management in Si-doped GaN became an important factor for fabricating GaN based devices with high reliability and performance. Strain caused by Si doping is widely observed in heteroepitaxial GaN, AlGaN, and AlN, independent of the growth method. In contrast, there was no measurable shift of the AlN bandedge for Si up to 1x1019 cm-3 for homoepitaxial growth on single crystalline substrates, implying that the strain is a consequence of doping and high dislocation density. Based on TEM studies, an effective dislocation-climbing model was proposed to explain the strain. However, the driving force for the dislocation inclination was still under debate :(1) a mask effect in which SiNx formation at the dislocation core blocks the dislocation; (2) dislocation climbing to relax the remnant strain, in which case the strain is the cause for dislocation climbing instead of the result; and (3) surface mediated dislocation climbing. By using co-doping, it was found that the tensile strain in Si-doped GaN is only related with the free carrier concentration. The strain became immeasurable as co-doped C electronically compensated the donor Si. Therefore, the dislocation inclination in n-type GaN is a result of dislocation climbing as governed by Ga vacancies during the extension of the dislocation during growth. Ga vacancy formation becomes favorable as the Fermi energy increases due to the increase in the free carrier concentration. This, in turn, will increase the climbing rate, causing a large inclination angle and strain. Such an effect is similar to the well known Fermi level effect in other III-V semiconductor. On Tuesday, May 3, 2011, Dr Ramon Collazo presented a paper entitled: "265 nm Light Emitting Diodes on AlN Single Crystal Substrates: Growth and Characterization." High crystalline quality AlN and pseudomorphic AlGaN films were deposited by metalorganic chemical vapor deposition on single crystal AlN substrates for the fabrication of a 265 nm light emitting diode with estimated IQE above 40%.